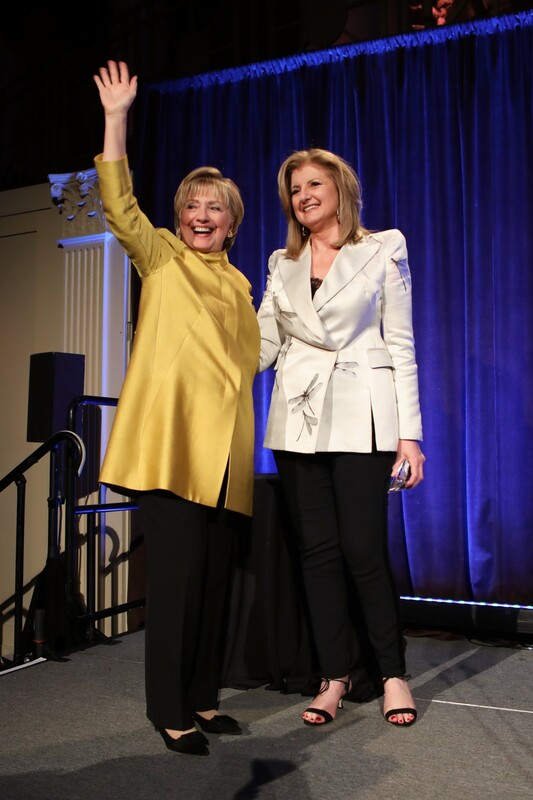 Huffington presented Clinton with the Trailblazer Award from The Lesbian, Gay, Bisexual & Transgender Community Center last night. “Thank you so much for this beautiful evening. Congratulations to Carmelyn, Jan, and Marc for your inspiring work. Thank you to everyone at the Center, and to the caterer for choosing a delicious vanilla cream meringue cake as our dessert–really glad you didn’t go with the chocolate cake, after what Donald Trump did while eating ‘the most beautiful cake you’ve ever seen!’ Now to the long list of things Donald Trump has ruined, we have to add chocolate cake! It is an incredible honor and privilege to present the Center’s Trailblazer Award tonight. It’s one of those rare cases where not only does the recipient need no introduction, but where it’s really, really hard to even give her one. Where do I start? And when a Greek woman is at a loss for words, that’s saying something. Hillary Clinton isn’t just a global leader. She isn’t just a role model for women of all ages, including my 25-year old daughter who is my date tonight. She’s a bigger than life cultural icon, and introducing her is like introducing a part of American history, like the moon landing or rock and roll. And on top of it, this is a woman who single-handedly brought back pantsuits, which we can all be thankful for. Her career has been long and storied enough to include fighting for progress, achieving progress and now fighting against the backlash to that progress. That’s what’s animated her work as an attorney, as First Lady, as Senator, as Secretary of State, and as the most famous grandmother not just in Chappaqua but in the United States of America. Hillary Clinton has both blazed trails and shattered ceilings. Her firsts are too numerous to mention, but let me just mention the two most recent ones: she was the first woman nominated for president by a major political party. And she was the first woman to win the popular vote by almost 3 million votes, which means that she inspired and led 66 million Americans to vote for a platform based on justice, inclusion, and equality — a platform that included calling on the country to address the crisis of transphobic violence, to pass the Equality Act, to end so-called conversion therapy and to protect the rights of LGBTQ people worldwide. Given the election results and the rhetoric coming out of the White House now, these words can no longer be taken for granted. The Center’s very founding in 1983, at the height of the AIDS epidemic, was an act of resistance, a refusal to be invisible, to be treated as anything less than a human being. We hear a lot about outrage these days, but the Center’s history shows how to channel outrage into action. Image courtesy of The Lesbian, Gay, Bisexual & Transgender Community Center.